In all my not-that-long career as a person who judges games with big numbers, I’ve only ever given out a single 10. Although that may be more of a statement about my editor’s reluctance to award any game such a high honour, and testimony to my stubbornness in that one case, I stand by that score. In case you can’t tell from the honking great title, that game is Kalimba – an underrated gem that deserved far more of a fanfare, especially given that it was made by a studio within Microsoft’s own ranks. Kalimba is my only perfect score, and for damn good reason. On paper it’s nothing colossally exciting – a simple 2D puzzle-platformer that has you controlling two characters at once – but as soon as you get the hang of the deftness and intense concentration the game requires, you’re hooked. The only bad thing I can say about it, other than the fact that it made me curse like a 12-year-old on Xbox Live, was that there wasn’t enough of it. Sadly, the studio behind Kalimba was shuttered at the same time as Lionhead – in the same press release, in fact – and poor Press Play’s demise was buried under stories about how great Fable 2 was. Which, of course, is true – but so was Kalimba. (And Max & the Curse of Brotherhood, Press Play’s other, also excellent release. They had a great track record, did Press Play.) But I won’t forget the time I spent with Kalimba, partly because it was a wonderful experience and partly because I’m incredibly bitter all my friends currently look down on me from their comfortable positions atop the online leaderboard. So smug. At the heart of Kalimba is a simple design choice – to use “trixels”, triangular pixels, rather than the standard boring square ones. The slight change in appearance this causes makes a big difference to the feel of the game, imbuing otherwise confident but fairly conventional platforming with the kind of charm I probably raved on about in my gushing ten-out-of-ten review. Tiny black triangles bounce around pretending to be lava, ice glistens in triangular blue crystalline structures and your character pieces themselves are like something out of Jumanji – brightly-coloured totem blocks that grimace and gurn as you tumble over gaps and somersault across the level. All of this gorgeous chaos is presided over by Hoebear, a relaxed, drawling magical bear that guides you through the tricks and tips and secret levels, instructing and cajoling you as you go. 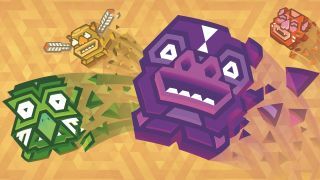 The goal is to get to the end of the level without dying – standard platforming fare – but colour-coded segments, collectibles, and various shape-shifting make this a difficult feat. I’ve decided to be satisfied with merely reaching the finish line in one piece, but the leaderboard makes it clear that my friends are much more perfection-minded than I. A similarly competitive person might take this for a challenge. I do not. Instead, I choose to revel in Kalimba’s unique take on a genre I don’t really like all that much. I generally find platformers tedious, repetitive, simplistic and far too difficult to keep my attention for long. I think they can be needlessly challenging and – well, this isn’t about my disdain for the platforming genre, it’s about the one that showed me I’d been too quick to judge. Kalimba impressed me so much that it became one of my favourite games despite being one of my least favourite genres, and that’s hard to do. I still find myself restarting levels over and over again, not because I am failing but because I can see exactly what I need to do and I’m merely struggling to get the jump timings just right. I imagine it’s a bit like that with ballet, but ballerinas don’t have to collect 70 hard-to-reach triangles as they flit around the stage – although I haven’t seen a ballet in a while, so I could be wrong. Kalimba has one of those deliciously devilish difficulty curves that makes everything look easy but keeps perfection just out of reach, leaving you grasping and trying and failing and striving for the game’s approval in a way that could be considered Freudian. It’s so beautifully balanced that frustrating mechanics always feel like the price to pay for fun, rather than a hassle or a tedious chore. And when you get it right, you get a gold star – or a gold totem piece, at least. And in the end, that’s all I want from Kalimba – the golden totem pole at the end that signifies a job well done in every level, and the respect and love of Hoebear. Kalimba itself is the gold totem at the end of Press Play’s short, sweet career – it too signifies a job well done, and the respect and love of this writer. Why not pay your respects with a download today?